A collaborative sports leadership academy effort for Lawrence youth! 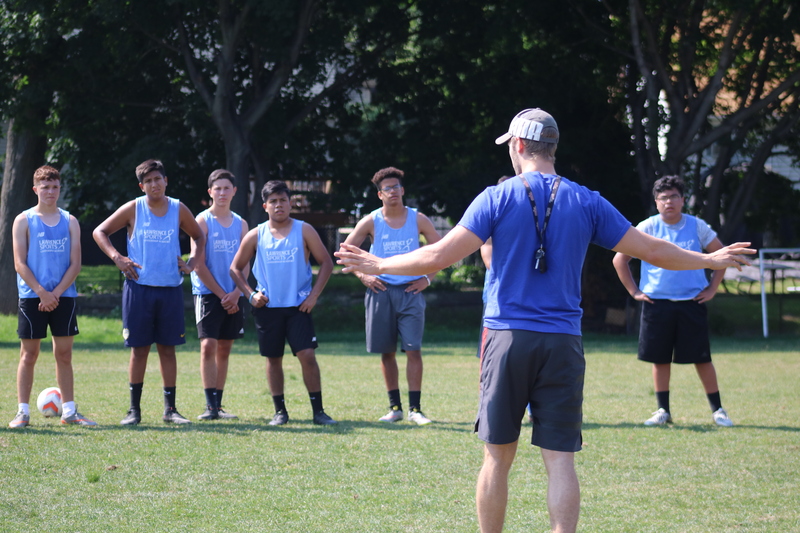 Beyond Soccer, Everyone’s A Player and Lawrence High Athletic Department teamed up in 2015 to bring a top quality, multi-sport leadership academy to Lawrence kids, in their own backyard. This effort was prompted by the City’s unfortunately low high school sports participation rates. According to data, only 12-15% of LHS students play 1 sport, while only 2-3% play 3 sports. We know how important it is to get these numbers up, and so much of it has to do with improving sports access at the elementary and middle school level, as well as expanding opportunities that increase high school sports readiness. Further, student-athletes, as well as those who stay busy, after school, in productive activities, graduate at much higher rates. For all these reasons, our collaborative Lawrence Sports Leadership Academy was born and has become an important focus. Further, LSLA participants benefited from daily speakers and fitness professionals, like LSLA keynote, James Orrigo ofLad In a Battle, who travels across the country, inspiring kids through music to find their purpose and help others in the process. We cannot wait to get him back in 2018! Sports psychologist, Ira Martin, of Prepare2Preform, also addressed our group on Day 3, sharing strategies to enhance participants’ mental game through positive self-talk and goal setting that included writing goals down where they can be seen every day. Mike Caron of Get Burly, came back for a second year, and got our group riled up, again, with his boisterous talk about “feeding the courage wolf” and an interactive lead-and-follow fitness activity that inspired our youth “be the best versions of themselves.” Former Patriot great, Ronnie Lippett, who was not any good at football in 9th grade, shared his story of determination and courage that eventually landed him as a New England Patriots cornerback for 8 seasons. We enjoy sharing stories that encourage youth to start sports at any age. More than 45% of participants reported that LSLA’s fitness sessions were their favorite part of LSLA. We think that is encouraging. Some of those fitness professionals included Lawrence natives, Tony Hajjar and Jake Bosse, who started Drive Custom Fit from the ground level. Today it is one of the most successful, area gyms. Steven Alario of Granite State Fitness, who made sure his workouts incorporated teambuilding attributes where the entire group had to complete challenges together. Tallie Abernathy and Dolis Negron-Rosario also hosted an awesomely energic Zumba session (these kids move much quicker to music and prompted us to bring in local DJ, DJ Double Vision on the last day! ), and the Thursday yoga sessions on Days 4 and 8, caught many kids by surprise. They could not believe how much they liked the challenging workouts. Many kids requested more yoga in 2018. We will make sure that happens. Thanks Becky Gabryjelski for being part of LSLA in both 2016 and 2017! Dushawne Simpson, Assistant Coach of Boston Breakers, along with Academy Coaches from the New England Revolution also challenged our soccer group with professional-level soccer instruction. Next year we will have more college and professional coaches join other sports groups, like Ushearnda Reynolds founder of United Conquerers Basketball and Frank Drejaj of New England Gladiators basketball who, like Ushearnda, had an impressive collegiate and post-collegiate basketball career. It’s exciting watching these two instruct Lawrence youth. As our LSLA tagline states — Learn.Committ.Achieve — we will continue working in the off-season, like our participants, to bring more resources into Lawrence so that youth can continue improving their skills, learn new ones, connect with a mentor, get inspired by a former or current professional athlete or coach, make new friends, adopt new strategies around goal setting and positive self-talk. Again, this can only be done through partnerships and we invite more groups to join us, as we expect LSLA to reach thousands of youth over the coming years. With that being said, a special thanks to LSLA funders Essex County Community Foundation, New Balance Foundation, Stevens Foundation, Sentinel Benefits & Financial Group, and Enterprise Bank. Also, don’t you think our LSLA reversible pinnies are sharp?! That is all New Balance. Lastly, an extra special thank you to the City of Lawrence for access to the beautiful Veterans Memorial Stadium, together with retired Athletic Director, James Liccardi who was around the table in 2015 with Stephanie McArdle (Beyond Soccer) and Michelle Adamic (Everyone’s A Player), and new LHS Athletic Director, Brendan Neilon, who is picking right up where Jim left off. There is much work to be done, but we are taking this opportunity to enjoy the success and positive feedback of this 2nd annual LSLA event. Good luck to all Lawrence student athletes this fall! One Response to A collaborative sports leadership academy effort for Lawrence youth!